I'm not sure the text is to be trusted (is she seriously saying that the Finns are Norse? If not, why talk about Vikings at all? ), but I like her ideas at the end about how to lay out all the bronze spirals for her apron so that they don't roll away -- single-sided tape! It's obvious in hindsight! A few weeks ago, I commented on how the Tuukkala outfit was reconstructed with the mantle pinned on the shoulder. Also, interestingly, Satu Hovi's page says there was a male cloak in Eura cemetery that was reconstructed as 110x160 cm, which isn't much larger to the female ones from Perniö. The joint search portal of Finnish museums, Museums Online! In a similar vein, here are some photos of the Kalevala Koru range of jewellery for 'ancient' dress, including prices. It turns out, that they're actually 11th-13th century, so early medieval really. The Hull and East Riding Museum says they're "part of Finno Ugrian Culture. Grave goods excavated from a tumulus at Efaefsk (Efaevo), Russia, 1900." And there are fairly interesting photographs online, too. This should cheer cathyr19355 up: KINCM:2008.6067.42, KINCM:2008.6067.55, KINCM:2008.6067.56 and KINCM:2008.6067.58, are "omega brooches." They also have some of the pins with the spiral top that pop up on ebay as so-called Viking hair sticks, too. But haven't seen the style that has perforations and beads threaded through them, though. According to the museum, in 1905 the British Museum purchased part of the collection, which you can search for using the term 'Efaevo.' No photographs, but more detailed written descriptions. I stand corrected! -- Another Finnish Underdress. It seems there might just be a 'plant fibre' underdress from Finland. Apparently it's in Ken kantaa Kalevalaa. From: Satu Hovi (2010) "Female Viking Finn Costume" Tournaments Illuminated 173; 15-18, 28. "In the cemetery of Masku, western Finland, an underdress made from plant fiber was found, dating to about 1000 CE. There were cloth fragments from both the upper and lower part of the garment. The fiber from the lower part was much more coarse than that of the upper, so the dress either has a fine upper part and a coarse lower part, which is a division very common in folk costumes from the 19th C., or the tunic and skirt were separate, as is seen in some Bronze Age Danish finds. In the later case, the separate skirt could be sewn as a tube length from the ankles to the breast. The skirt is girded with a tablet woven band in the waist and the leftover upper body length is allowed to fall and cover the belt." The rest of the article is a more condensed and polished version of Satu's website, with a bit more emphasis on references. There is a lot of interesting things just casually referenced in it. The interesting thing, is that Jenny Kangasvuo's page says the two-piece tunic is the Kaarina dress. The Kaarinan dress seems to have been analysed as part of Jaana Riikonen's masters thesis "Naisenhauta Kaarinan Kirkkomäessä. But the reference for the reconstruction itself comes from (as best as I can tell) a book on folk costumes, called Ildiko Lehtinen and Pirkko Sihvo. 1984. Rahwaan puku /Folk Costume, Museovirasto, Helsinki. So, I'm guessing the people who are leaning towards the folk-costume dress (at the very least, the idea that tunics have waist seams, which I've vaguely mused about before), aren't trying to adapt the Eura gown idea? Who knows. I stopped because my ribs started hurting, but there is a lot more to write I promise. Feel free anyone who wants to comment, to say something. I hope this is some sort of translation error, otherwise WTF?? ...from the 1000 A.D to the middle of 1300 A.D., in Western Europe, women used to keep their hair wildly open. In 1100 A. D. in German literature are the first notes of the “schapel”, which was a headband used around the head to the keep hair from falling over the face, and in France it was widely used in 1200 A.D. So, from the 11th to the 14th century, women had their hair uncovered? Maybe they mean it wasn't held back with a hairband? The veil as a headgear of the Finnish women is from 1100 -1300 according to the archeological founds in Perniö, Tuukkala and in southeast Carelia. In Carelian tradition girl’s hair was normally cut already as a child. Before the confirmation they let the hair grow a little longer so that they could have their hair bound into the “sykeröt”, nuts for fastening the veil and its holders, if their own braids were already cut. The way, how the married women tied the veil, was often taught by a special veil – binder woman. OK, this is really interesting, the hairpiece associated with the Kaukola grave has been interpreted as a sykerö and worn on the head with the veil. Metsäpirtin puku -- A thesis on the construction of the dress of the Metsäpirtti region. Lots of diagrams and cool things. I love Finland, lots and lots. Current Music: listening to the neighbous scream incoherantly. Hooray. I'm beginning to think there is something about Thor Ewings theory about the seperate skirt-and-yoke style tunics being native to Scandinavia. The latest thing to catch my eye is how the Jelling stone has been repainted so Jesus is being crucified in a really interesting shirt. Some off-topic images of medieval recorder players. and a 5th century BCE Sheepskin coat from Poland. Too hot to use HTML. Bah. Articles from Finnish scholars about medieval toilets, in PDF. Tarja Halonen is in Australia *fangirl* and then she's going to New Zealand. Ms. Halonen is such a cool president. She has worn a reconstruction of the Eura gown, has tasteful heraldry, has campaigned for gay rights, has cats, and speaks a stack of languages that puts me to shame. There's bound to be more pictures, but my Finnish isn't good enough to search effeciently for them. Padasjoen löytö. Looks like some sort of archaeological dig? Kukonharjulla tehtiin löytöjä. 18-19th century archaeology? Kurkistuksia Helsingin kujille has 17th century shoe soles? Kristinuskon tulo Suomeen History of Christianity in Finland? Some thumbnail images, including some 12-13th century stuff, if I remember correctly. And this links list is pretty cool too. Halikon puvun taustalla on Rikalanmäen hautalöydöt. Pukua on oletettavasti käyttänyt Rikalan emäntä juhlapukunaan vajaa tuhat vuotta sitten. Vähäisten löytöjen takia ei voida tietää, millainen puku on oikeasti ollut. Kukaan ei ole koskaan valmistanut virallista konstruktiota Halikon puvusta, sillä sen tekeminen tulisi erittäin kalliiksi. May I present, the Halikon puku from Haliko parish. Also, photos of work by well-respected Finnish archaeologists, and their contact details. A very short review (scroll down) of Trapezoid Tombstones in Estonia -- I had never really noticed that these even existed before, but doing a quick google search reveals I must have read about them previously when researching early figural sculptures. What Ancient Human Teeth Can Reveal? Demography, Health, Nutrition and Biological Relations in Luistari by Kati Salo is online for download. Wordplay in Donald Duck comics and their Finnish translations by Maarit Koponen may be proof that Donald Duck is not banned in Finland. The round Finnish brooches at Raymonds Quiet Press are accurate for a Eura style outfit, only they come from grave 35, not grave 56 which is the really famous one. That's why they look so badly done, because they are a poorer version of the 56 brooches, but are actually spot on for the 35 ones. And just for reference, grave 35 is often considered to be a 'cross-dressing' Finn as she also carries an axe on her. It's an entire university subject devoted to Finnish clothing reconstruction oooooh! Some brooches and an interesting weave of fabric. 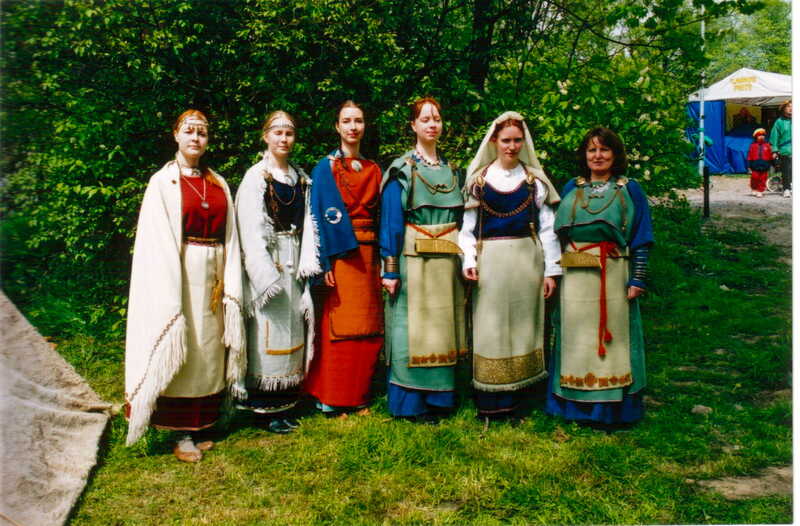 Modern reconstructions of Finnish dress. There are Apparantly picture gallieries of artifacts and other shinies, but my slow 56k connection can't seem to cope with it. A nice collection of links. Stuff has been uploaded The draft of the SCA alternate titles which still needs work, but it's something, and the quick-n-dirty Finnish costuming glossary. I still need to add the adjectives and naalbidning section to that page.